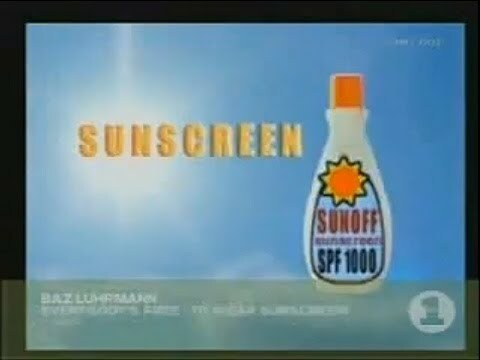 Every few weeks I remember a great 90’s song named “Everybody’s Free (To Wear Sunscreen)” by Baz Luhrmann. I’m sure you’ve heard of it, but I thought I’d post it anyway to remind you. It puts things into perspective for me, it makes me realise that there’s no point in worrying endlessly about a particular issue, you can either do something about it or move on to something else. The original words for this song were written by Mary Schmich, a columnist for the Chicago Tribune. If I could offer you only one tip for the future, sunscreen would be it. The long term benefits of sunscreen have been proved by scientists whereas the rest of my advice has no basis more reliable than my own meandering experience, I will dispense this advice now. Enjoy the power and beauty of your youth; oh never mind; you will not understand the power and beauty of your youth until they have faded. But trust me, in 20 years you’ll look back at photos of yourself and recall in a way you cant grasp now how much possibility lay before you and how fabulous you really looked.You’re not as fat as you imagine. Dont be reckless with other peoples hearts, don’t put up with people who are reckless with yours. Dont waste your time on jealousy; sometimes you’re ahead, sometimes you’re behind; the race is long, and in the end, its only with yourself. Don’t feel guilty if you don’t know what you want to do with your life. The most interesting people I know didn’t know at 22 what they wanted to do with their lives, some of the most interesting 40 year old’s I know still don’t. Be kind to your knees, you’ll miss them when they’re gone. Maybe you’ll marry, maybe you wont, maybe you’ll have children, maybe you wont, maybe youll divorce at 40, maybe you’ll dance the funky chicken on your 75th wedding anniversary. What ever you do, don’t congratulate yourself too much or berate yourself either your choices are half chance, so are everybody elses. Enjoy your body, use it every way you can. Don’t be afraid of it, or what other people think of it, its the greatest instrument you’ll ever own.. Even if you have nowhere to do it but in your own living room. Read the directions, even if you don’t follow them. Get to know your parents, you never know when they’ll be gone for good. Understand that friends come and go, but for the precious few you should hold on. Work hard to bridge the gaps in geography in lifestyle because the older you get, the more you need the people you knew when you were young. Accept certain inalienable truths, prices will rise, politicians will philander, you too will get old, and when you do you’ll fantasize that when you were young prices were reasonable, politicians were noble and children respected their elders. Don’t expect anyone else to support you. Maybe you have a trust fund, maybe you have a wealthy spouse; but you never know when either one might run out. Don’t mess too much with your hair, or by the time its 40, it will look 85. This entry was posted in Miscellaneous and tagged (To Wear Sunscreen), Baz Luhrmann, Everybody's Free on March 7, 2010 by papa_face.